My office is strewn with cables, mostly, apparently of the USB variety. Yet can I find one when I need to sync data? As swapping fiddly microSD cards between computers, mobiles and tablets is an inconvenience I can live without, cables are preferred, but rare. So why don’t I just use the cloud? Keeping your data safe on portable devices proved challenging when smartphones first came along, and these same challenges exist for tablet computers. The only way to realistically keep data safe in the absence of removable storage is to rely on the cloud. Quirks in mobile Internet speed and the presence of Wi-Fi networking on mobile devices mean that syncing data with a cloud account is now so easy that we barely notice it happening. HP TouchPad users have a number of cloud options (whether using webOS or Android), enabling them to ensure that data remains safe on a remote server that can be accessed from a different computer in the event of mobile device failure. Before worrying about the existence of applications that can enable cloud storage of documents that you’re currently working on, however, concern yourself with the straightforward “how do I backup my TouchPad” problem that many users face – but only when it is too late. Thanks to some excellent built-in software, webOS users can create backups of their operating system files which are backed up to a cloud server. These can then be used to get your HP TouchPad back into working order when the time comes. Via Launcher > Settings > Backup you will find the relevant options. You can activate Backup by sliding the switch to On, initiating daily backups. It is also possible to make a manual backup via the Back Up Now option. If data needs to be restored to your HP TouchPad (for instance following a failed backup) this can be done via the webOS Doctor. Offering a minimum of 150 GB of storage, Egnyte is aimed at business users of the HP TouchPad; as such, it isn’t free, instead providing cloud functionality for five users starting at $24.99 a month (and rising, depending on the size of business). Fortunately, however, it does offer a trial version so that you can check the speed, reliability and overall quality of the service. Signing up is simple, and the service has an easy to use interface. The only problem, really, is that the app doesn’t appear to run as an app. Instead, users are directed to the browser-based interface to the service. This isn’t a problem as such – it’s nice to see an interface that is easy to use in the webOS browser – but obviously it means that this service isn’t exclusive to webOS. Of course, if you have access to another operating system with which you plan to swap files, this isn’t necessarily a bad thing. Sadly there is no DropBox app for webOS – access is limited to the browser interface unless you’re wishing to spend $4 on Dropboxify HD. This doesn’t really come into the realms of “free” or “low cost” that we like to promote on MakeUseOf; nor does it offer a free trial. Instead, if you want to use DropBox on the HP TouchPad, you will need to install Android on tablet; an official DropBox app is available that offers considerable functionality, enabling shares, uploads and downloads from the device. If you haven’t yet installed Android on your HP TouchPad, these instructions will explain fully How To Install Android Ice Cream Sandwich On The HP TouchPad In Minutes How To Install Android Ice Cream Sandwich On The HP TouchPad In Minutes As slick, smooth and functional as webOS is on the HP TouchPad, and wherever the future of the platform may lie, there remains a problem – the shortage of apps. The fact remains that there... Read More how this can be done. By far the best cloud option for webOS users is Box, an app that can be installed free on the HP TouchPad under its native operating system. 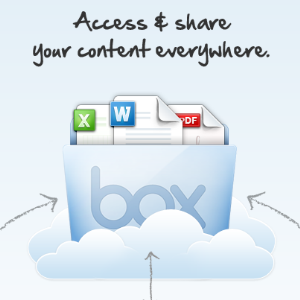 Available from the HP App Catalog, Box offers an amazing 50 GB of storage to TouchPad owners, absolutely free! Files can be accessed on any other device, shared with friends using a link and although there is a 100 MB file limit (preventing the upload of large video files, for instance) Box remains a must have app for any HP TouchPad owner, effectively increasing the available storage on the device by 50 GB! HP TouchPad Android users can also access Box, using the same account name and thereby accessing the same degree of storage. Despite the continued respect among TouchPad users for webOS as a functional operating system with a slick UI, it is sadly lacking in cloud storage options, another reason for the sad (but completely understandable) migration of users to other devices or installing Android on the tablet. Fortunately the 50 GB from Box gives webOS users an excellent cloud storage option, while those users who have HP TouchPads via their employers should perhaps mention the existence of Egnyte. Finally, remember that critical (non-app) data on your TouchPad is backed up daily to a remote HP server, ready for restoration in dire circumstances. Explore more about: Cloud Computing, Cloud Storage, Data Backup, Dropbox, Web OS. Click Settings then Accounts then Add Account then Dropbox. Dropbox is built into webOS 3.
:) A lot of people seem to miss that. One of the things that totally endeared me to webOS right from the start was the vast number of things that came preloaded in it's Accounts setup. It is a somewhat limited support, though - I think you can only use it with Documents apps, such as QuickOffice. Dropboxify adds more usability.